For this jasmine tea, the bumph says “tender young tea buds mixed with fresh jasmine flowers yield a soft, sweet, fragrant infusion”. Trouble is, it didn’t give any measurement instructions so I added my usual tablespoon and while unlike the Newby tea I didn’t get a strong tea infusion, I did get a very strong jasmine infusion. Perhaps because it was very fresh or perhaps because it is probably the best jasmine pearl tea I’ve ever had but this tea is intense. There is no chemical flavour to it and the green tea is hardly intense, not only balancing it off nicely but also making me wonder if this isn’t white tea. This tea claims to be repeatedly infused with jasmine and I can believe it and it also explains why Matcha Chocolat’s jasmine pearl chocolates were so absolutely wonderful. 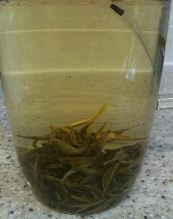 Be warned this makes an intense jasmine tea. It is not perfumed or synthetic but it is still intense and so if you don’t like jasmine tea or if you’ve never tried it before, I’d go with the Newby jasmine tea pearls first and then graduate on to this tea. I combined this tea with a nibble bar from Askinosie. 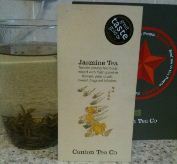 I found the cocoa nibs and lightly fruity dark chocolate combined well with the intense floral tea. I have to say another chocolate or a less intense, acidic one might struggle against the flavours in your mouth.